Easter in Bermuda, as in many places, is celebrated with festive meals, egg hunts and going to church. But what makes Bermuda unique is the tradition of kite-flying on Good Friday. ‘KiteFest’ has spanned more than four decades as an integral part of the Island’s cultural calendar, and is enjoyed by Bermudians, expats and visitors alike. It has carved out a successful niche as a fun, traditional family event that is eagerly anticipated on the annual calendar, bringing together people from all walks of life. With the gorgeous Horseshoe Bay Beach as its venue, the blue sky above is transformed into a dancing mosaic of brilliant and beautiful shapes, colours and sounds. The event features live local entertainment and also has special workshops and activities geared towards visitors. Nobody is certain how this long-established tradition started but one story often repeated is that it began with a Sunday school teacher’s creative lesson on Jesus Christ’s ascension to heaven. It’s said the teacher made a cross-shaped kite, took it to a hilltop, and set it flying, while the students watched it sail upward towards heaven. 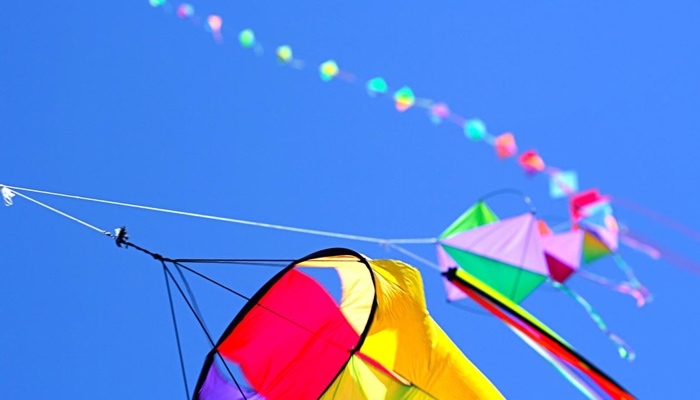 Good Friday now to most on the Island is about flying kites on the beaches, enjoying festive atmosphere and having traditional codfish breakfast and cakes. The kites are made of colourful paper tissues, wood or stripped bamboo sticks, strings and metals, and usually have a long tail that helps to balance it during flight. You can make your own (or cheat by buying one on the beach or in a local shop). And some of the kites are so huge that it takes several people to hold and release them in the air.